This spring we had the golden opportunity to introduce the first of Porto Photo Fest’s foreign photographers to the city of Porto. It’s no secret we love our city, but is there anything more exciting than seeing a newcomer fall in love, too? Lifestyle blogger Paula Calheiros of Viver O Porto interviewed analog specialist Cradoc Bagshaw recently, during his visit in May. Cradoc will be giving a series of street photography workshops during Porto Photo Fest starting with “The Complete Street Series” (September 11-13), an Experienced Analog Photography Workshop (September 14-15), and a “Beyond the Street” masterclass on Sunday, September 17. 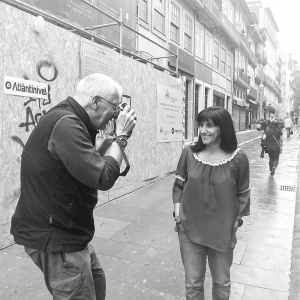 We met with Paula at Rua das Flores for the interview and were at the other end of the lens this time, where she asks Cradoc about his impressions of Porto, his early days in photography, his approach to street shooting, and — of course — the hotly-debated question of analog vs digital. Connect with Paula through her blog, Viver O Porto, her Facebook page, or Instagram. She can also be seen on Porto Canal’s show “Olá Maria!” on Mondays.